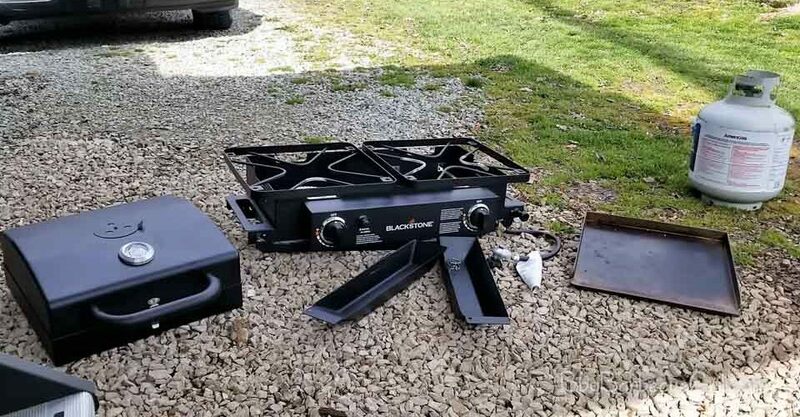 The product, Blackstone grills tailgater is quite perfect for outdoor cooking, the tailgater makes the perfect fit for taking cooking and grilling up to another level. It has adjustable legs which make it easy to place on any surface and still be leveled. It can also be carried to any place. This tailgater can be used for mainly outdoor purposes. The product has two hot burners which give you the ability to cook differently on the same surface. It has a barbecue box for grilling and a flat surface for cooking, griddle, and grilling. You can, however, decide to use a stock pot or frying pan on the flat surface. You may be looking for a portable grill suitable for your fishing trip, picnic, hunting, tailgating etc… However, let’s look at the specs of Blackstone grills tailgater. The grill comes with astounding features that you could never think of. Asides from the fact that it has two burners, it also has some other amazing specifications. Cooking configuration Griddle and standard burners for cooking. The Blackstone grills is a product and a must have for every tailgater, hunter, fisherman or family that may want to go out for an outdoor event. It has two hot burners that make cooking faster and easier. Its dual cooking surface is large for a multi-purpose grill i.e., a barbecue grill box on the left and a flat surface griddle on the right. You can also grill and cook at about +500 degrees on the grill box. Although with its double burner, you can remove either side and gain access to any of the burner. The tailgater is portable and can be used at any event. Any new user can easily put it up and assemble it for use. Both the grill box and griddle can be used at the same time and you may decide to open the burners for pots/pans. So many options to choose from! The Blackstone grill is versatile. You can decide to cook, grill or griddle whichever you want. You can choose from cooking, grilling or barbecue. Whatever you want. It also has a high satisfaction guarantee. People who have bought it prefer using Blackstone grills because of its multipurpose use and comfortability. Blackstone Grills Tailgater has an effective design which makes it quite easy to set it up and put it into use within a few seconds. This tailgater item remains the best grill and griddle product for outdoor gatherings and mostly for fishermen, hunters and the likes. The product is highly strong, durable and can be used to carry out cooking effectively without chaos. Not all griddle fits in the grill box. The grill needs some time to heat up. Finally, this product comes with a nice carrying bag set in which the grill and griddle can conveniently go into separate compartments all in one bag. Although it doesn’t come with a good fitting cover Blackstone makes separately covers specifically for the tailgaters so you can worry less about leaving your grill outside. With this fabulous grill and griddle, more people would be able to go out without the fear of not getting what they want when it comes to getting a barbecue and grill food.